Praxis Exercitiorum Spiritualium P.S.N. Ignatti. 333G Izquierdo, Sebastián1601-1681. Ignatius,; of Loyola, Saint,; 1491-1556. Praxis exercitiorum spiritualium P.N.S. Ignatti. Auctore P. Sebastiano Izquierdo Alcarazense Societatis Jesu. First edition 12 full-page engravings ;each page of the text is printed within an ornamental typographic border. This is a nice clean copy, unlike the copy which has been digitized which is a mess and terribly browned . The copy offered here is clean and crisp, it is bound in modern marbled paper wrappers. 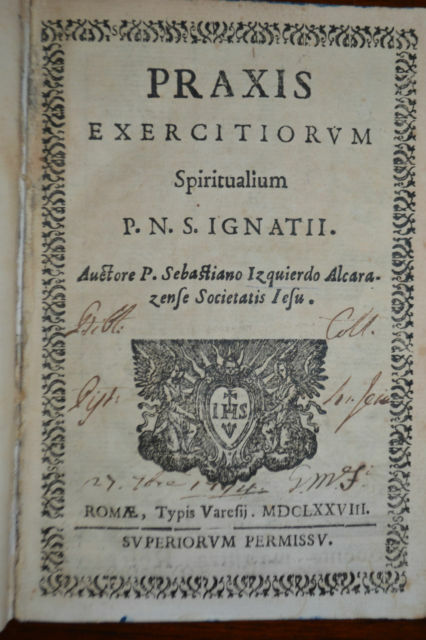 The Jesuit Sebastián Izquierdo in his Práctica de los ejercicios espirituales, written in 1665 translated in to Italian the same year then in 1678 translated as here into Latin and later published in several translations and versions offers an illustrated guide to the Ignatian spiritual exercises. 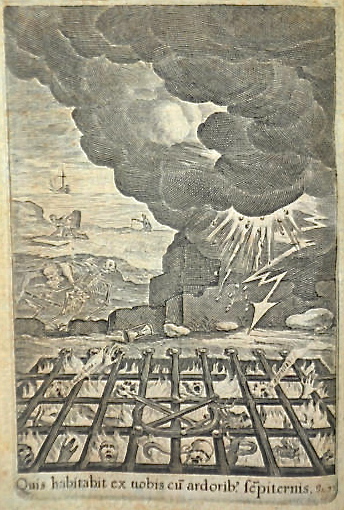 The illustrations, 12 of them, are the subject of image meditation which was a favorite method of the Jesuits who, beginning with the monumental Evangelicae Historiae Imagines (1593) of Jerónimo Nadal, actively took hold of religious iconography and adjusted and concentrated it for the teaching of the Societies ( and Ignatius’ ) vision. The images are not just simple depiction’s instead they are mnemonic devices. These images are points of departures and give the current 21st century reader a precious examples of images that inspire meditation, direct the reception of the teachings and anchor them in the memory. Particularly memorable is the Image of Hell on page 72, or the Puteus Abyssi (the bottomless pit) . The lay-out shows the pedagogical intentions and possibilities of this little book: there are 12 parts consisting of 12 separate quires, numbered from ‘A’ to ‘M’ and paginated each from 1-12, each with its own full-page illustration , these could have been meant to be distributed separately – according to match the educational needs or level of the students. The Images are in high contrast, with plenty of Bloody and memorable images. 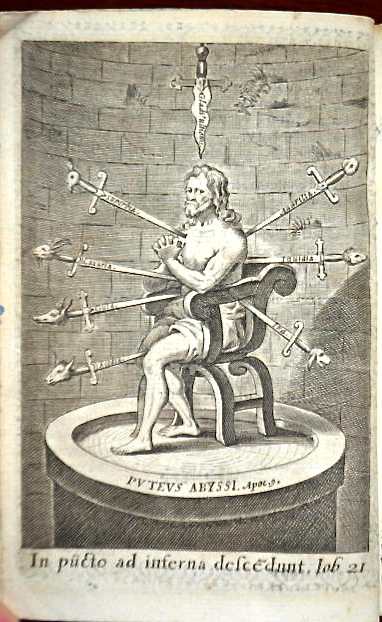 swords, each with animal head handles, in him and each is strategically stuck in various parts of the body. The swords are labeled for the passions. Most interesting of these might be the sword marked ‘Vengeance’ it is hanging offer the mans head, the Idleness sword is stuck between his legs, Gluttony in his stomach, Lust … Envy in his back, Avarice between his Shoulders and Pride in his heart. Izquierdo was also the author of Pharus scientiarum, a treatise on a methodology to access knowledge, conceived as a single science. In this work, he assimilated Aristotelian and Baconian logic, and he expressed some original ideas on mathematics and logic that have earned their author a reputation as an outstanding mathematician. Not just like his Spanish contemporaries John Caramuel or Tomás Vicente Tosca , but also significant foreign mathematicians as Athanasius Kircher , Gaspar Knittel or Gottfried Wilhelm Leibniz , the latter, in particular, cited with, his Disputatio of Combinatione, in Combinatorial Art (1666).